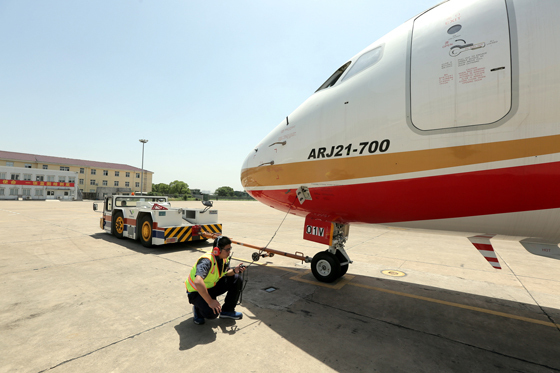 ARJ21 AC111 completes maiden flight__Commercial Aircraft Corporation of China, Ltd. The aircraft took off from Dachang Airbase on May 23rd, 2018. 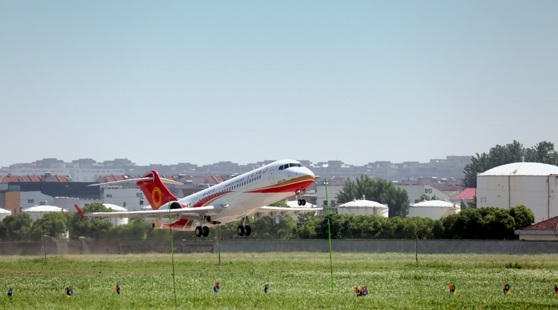 ARJ21-700 AC111 completed the first production flight test on May 23rd, 2018, the fourth anniversary of General Secretary Xi Jinping's visit to Commercial Aircraft Corporation of China, Ltd. (COMAC). Cadres and workers of COMAC had carried forward the spirit of Chinese trunk liner, i.e. servicing the nation with aviation, "Four Long-Terms" and "Never Give Up", with unremitting efforts. 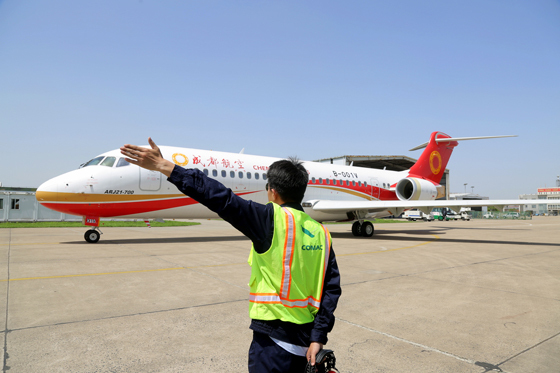 ARJ21 AC111 took off from Dachang Airbase at 14:00 on the same day, returned and landed safely at 16:43 after a flight of 2 hours and 43 minutes, indicating a completion of the predetermined flight test. 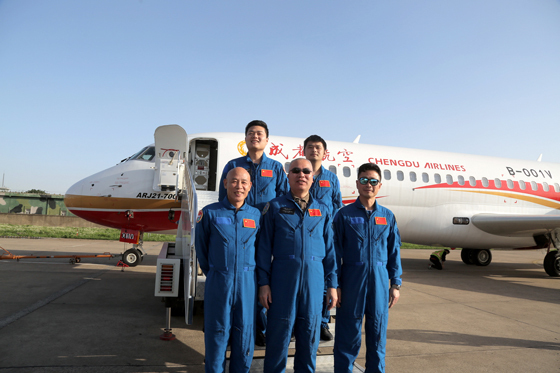 Crew members of this flight test include Test Pilots Zhu Weiwen, Wei Guoqing and Li Mozhu, and Flight Test Engineers Wang Kui and Liu Peng. This flight preliminarily inspected the takeoff and landing performance of the aircraft and the operation of main systems and equipment. 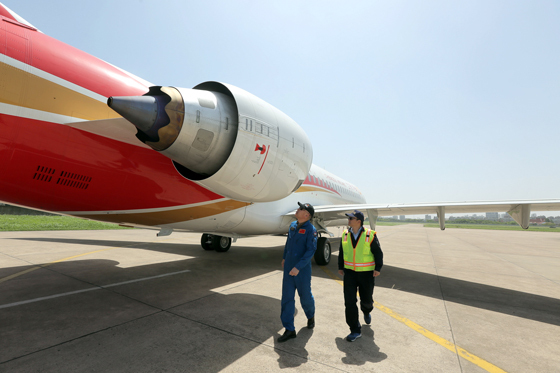 29 test points of flap extension/retraction system, landing gear system, and navigation and communication systems, engine acceleration and deceleration characteristics, and Stall Protection System (SPC) of the aircraft were inspected during the flight. The test result showed that aircraft's status is fine. The flight test crew made preflight preparation on May 23rd, 2018. 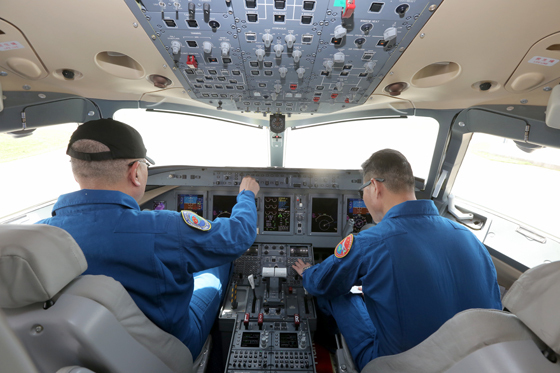 The flight test crew inspected the aircraft on May 23rd, 2018. A photo taken during preflight preparation on May 23rd, 2018. 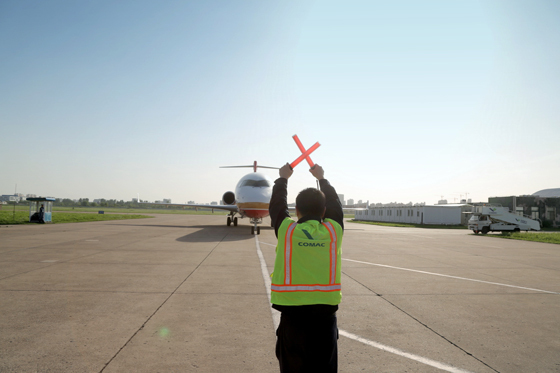 The aircraft was ready to take off on May 23rd, 2018. The aircraft returned to Dachang Airbase on May 23rd, 2018. A group photo of the flight test crew taken on May 23rd, 2018. Two ARJ21 aircraft gathered at COMAC Flight Test Center on May 23rd, 2018.